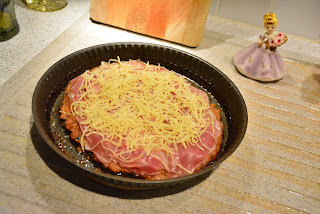 The Paris Feast: Low-carb pizza with prosciutto and cheese topping. 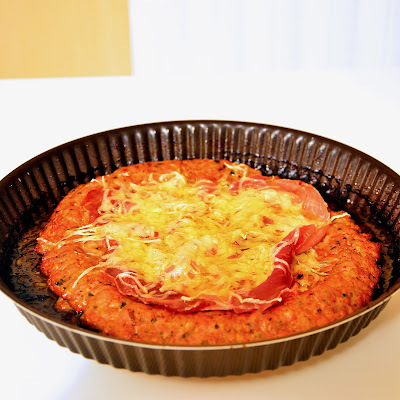 Low-carb pizza with prosciutto and cheese topping. I was in the mood to try out and innovate a new dish, something I have not found on the internet (at least on the first few pages of Google). 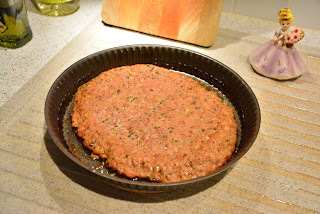 I had some minced meat that Mitra got from the farmer’s market and I was forced to use them up (meat from farmer’s market do not contain the horrible dangerous etc. preservatives and so cannot be stored for long). 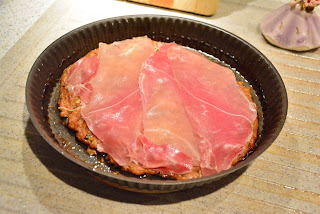 I also had some Prosciutto di Parma which was heading quickly towards the best before date. So the boundary conditions on my innovation were already set. Now let me see, a lot of meat, why not try out a special diet. Though I am quite a glutton and cannot restrict myself and this blog to a particular diet but there is no harm in trying out some from time to time mainly keeping in mind my diverse readers. So this is the result of my innovation, a low-carb pizza. Low carb diet has been making some buzz and you can find the details here [1,2]. Low carb diet simply means you eat fewer (or zero) carbohydrates and a higher proportion of fat. The diet consists of eating meat, dairy, eggs and vegetables growing above ground and avoiding all sources of carbohydrates such as rice, beans, potatoes and mainly bread. So you must be wondering, a pizza without bread! 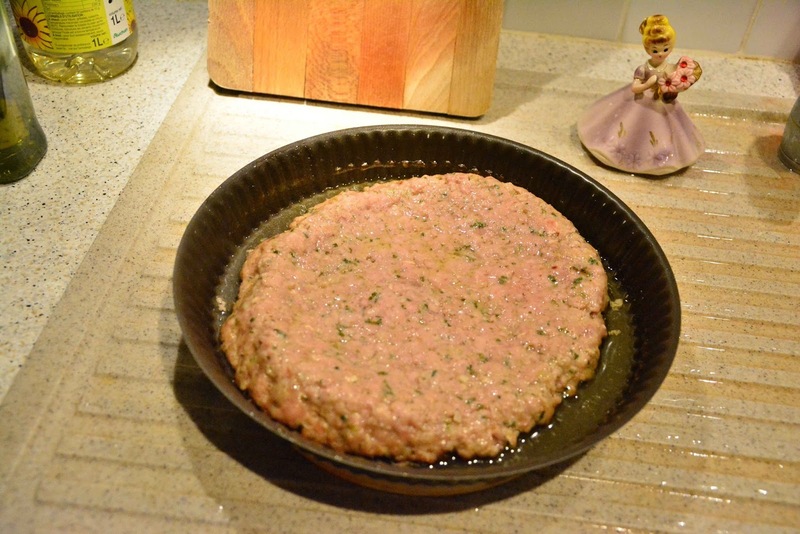 Well this is the pizza where meat itself is used as the base, sounds terrific doesn’t eat. 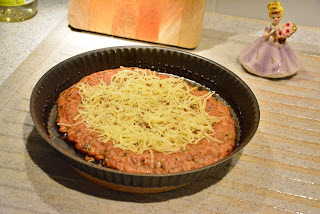 I also removed the tomato sauce and thus this dish had just meat and cheese. 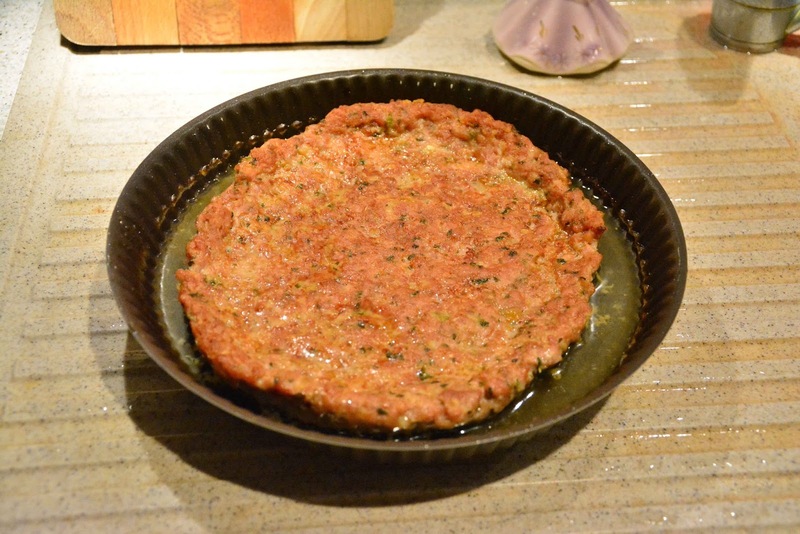 Apart from being low-carb this dish is super-tasty meaty delight and perfect to surprise anyone. Grease a tarte pan nicely with 1 teaspoon of oil. Place the minced meat and slowly press it to the shape of the pan. 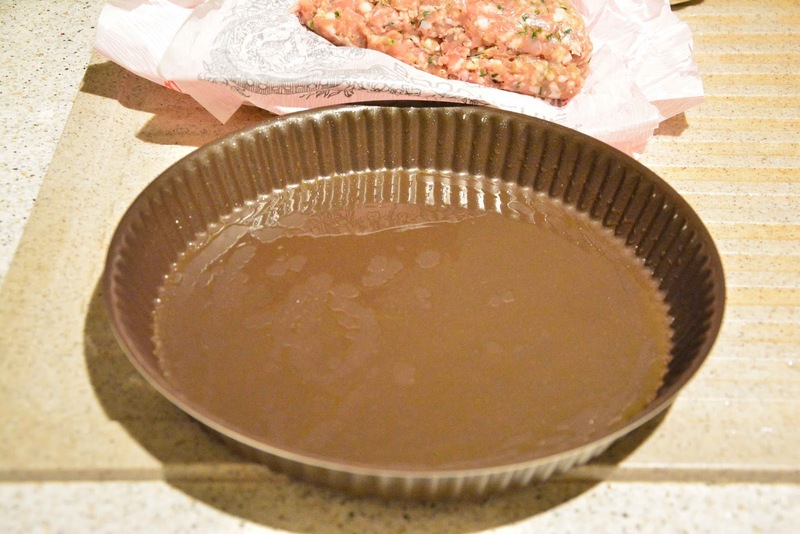 While doing it be careful to maintain equal thickness of meat throughout the pan. 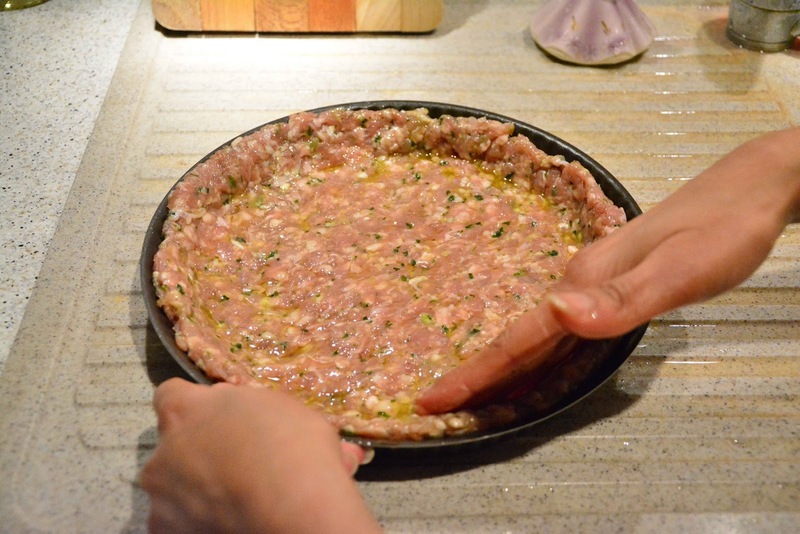 Pour 1/2 teaspoon of oil on your palm and grease the top of the minced meat layer. 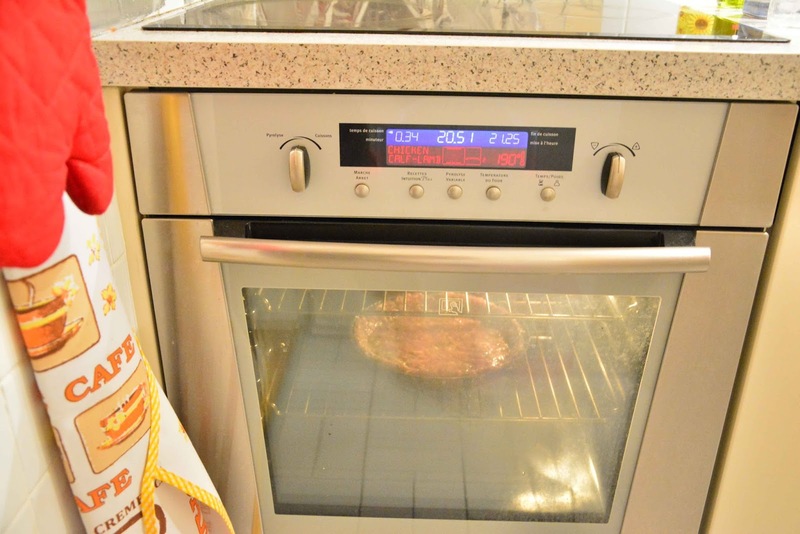 Place it in a pre-heated oven at 190°C for 30 minutes. Take it out (it is half done). It will shrink but will be well bound. 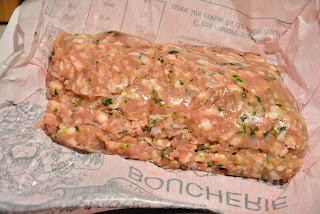 Turn the side of the meat (be careful not to break it). Put it back in the oven at 190°C for another 20 minutes. 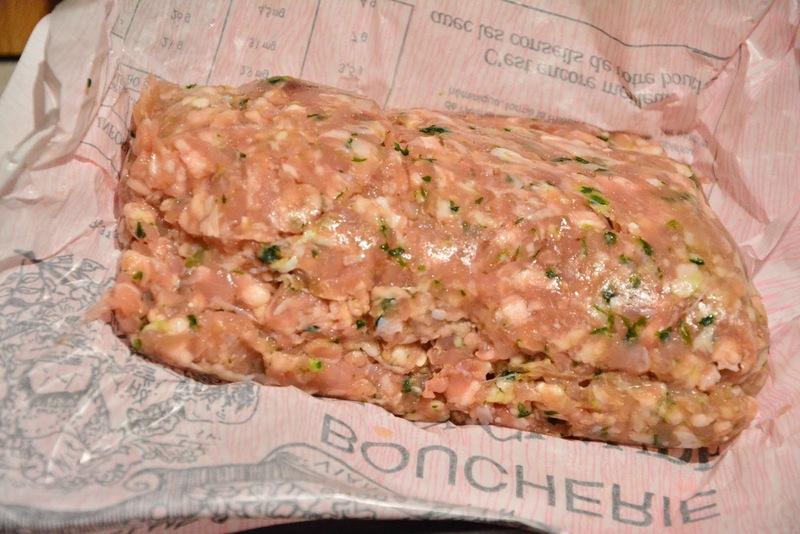 Put one layer of cheese on the meat. Put another layer of cheese on top. 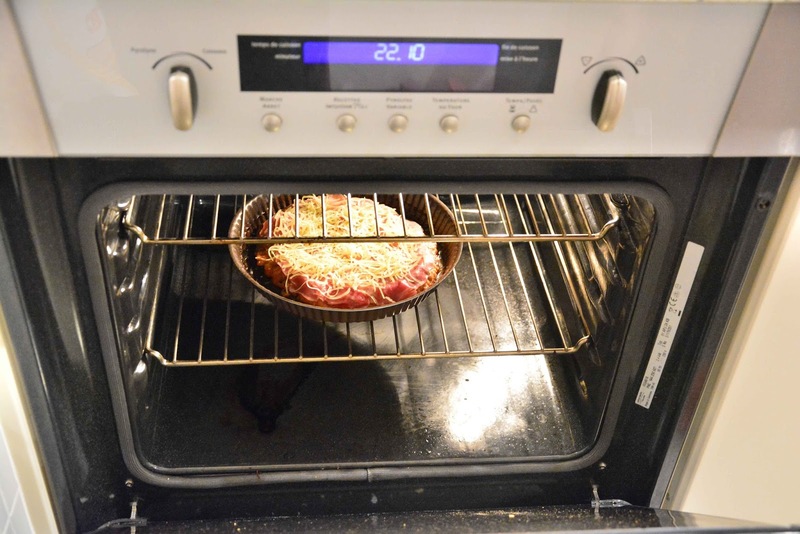 Put it back in the oven at 190°C for 5 minutes. 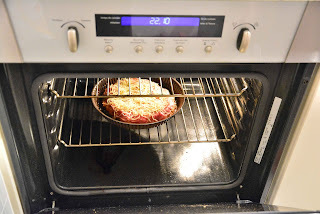 The pizza is ready and it should easily slide out of the pan. Cut it into slices (like a real pizza and serve). Low carb diet simply means you eat fewer carbohydrates and a higher proportion of fat. So here is a low-carb pizza where meat itself is used as the crust and topped with prosciutto and cheese. 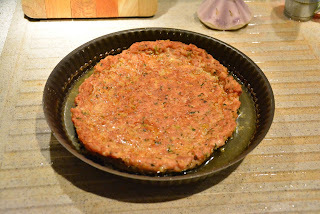 Place the minced meat and slowly press it to the shape of the pan. Put one layer of cheese on the meat, then the ham slices and another layer of cheese. Cut it like a real pizza and serve. I tried a way that I think is better. 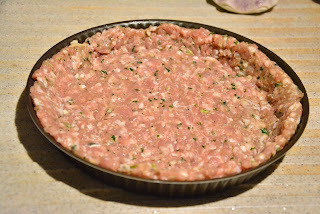 Take one pound of ground meat, cook and drain. Let it cool down and mix with one cup of Mozzarella. Spread out onto a 12 in pizza pan, add your sauce, toppings and bake until done. Thanks Frank, but my idea was to make it low-carb. Mozzarella has 3.1g of carb per 100 gm while emmental has 0 so it fits into the low-carb category. That is why I resisted adding a sauce as well. So I used this process to help bind the meat without mozzarella. Your point was helpful to justify the process. Thanks again.